It was a lot more fun than I had anticipated! After years of telling myself it’s not for me, it felt surprisingly engaging in trying to figure out how to approach the challenges. It became a puzzle of sorts as I tried to figure out my weaknesses while playing on my strengths… ultimately reaching the point where I just felt excited participating in the creative process itself. Even drawing and seeing the result felt rewarding despite the fact it’s always been one of my weaker points. The competition is by now over and I have decided to publish my entries here on my blog. There are three of them – a Christmas drawing, a rewritten Christmas song and a short story related to last-minute Christmas shopping – and before each there is a brief foreword detailing my inspiration. I decided to base every entry on the manga Nisekoi as I felt it would be interesting to limit myself. 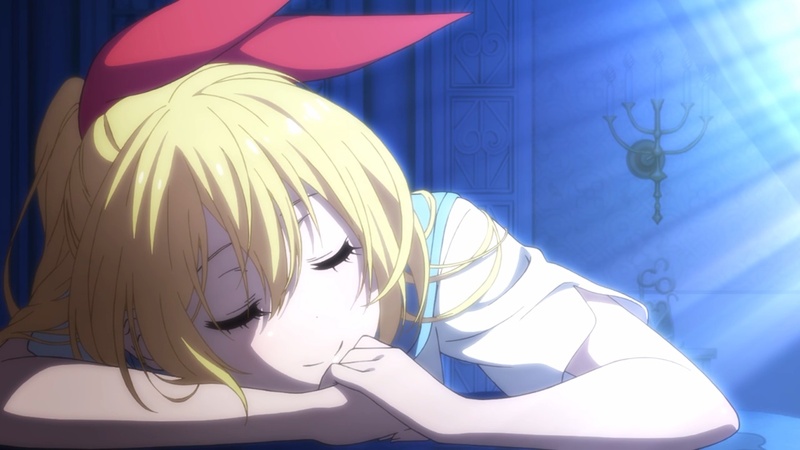 Nisekoi also happens to be one of my favorites. Today mainly found in the Nordic countries, the 13th December is a staple of traditional celebrations and a memorable moment when you can feel that Christmas is really around the corner. Originally meant to honor the Christian martyr Saint Lucia (or Saint Lucy, as commonly referred to in English), it today is a day where choirs dress up in white – with a female lead wearing a wreath of candles – and sing various Christmas songs. The idea came to be as it’s a Christmas tradition and adore. 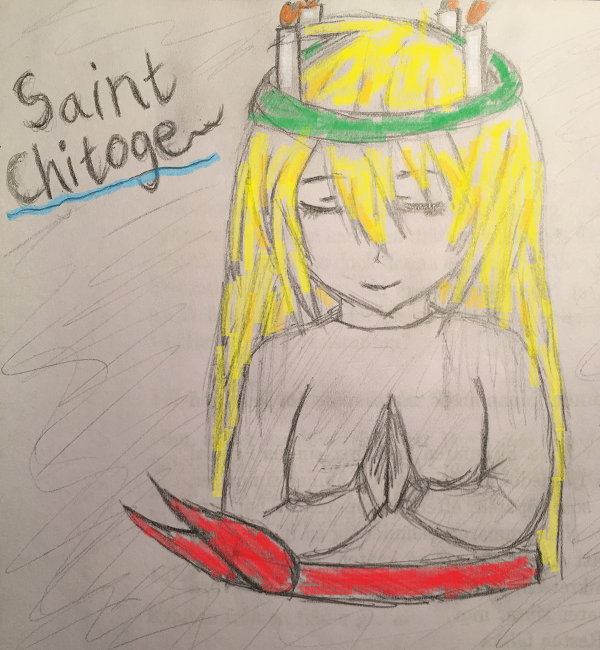 Chitoge from Nisekoi also has long blonde hair, which appropriately just so happens to be the traditional representation of Saint Lucia. Before drawing I looked up various images of Chitoge in order to see if there were any particular details outside of the signature ribbon I needed to take into account. One such detail, I discovered, was her small antennae. 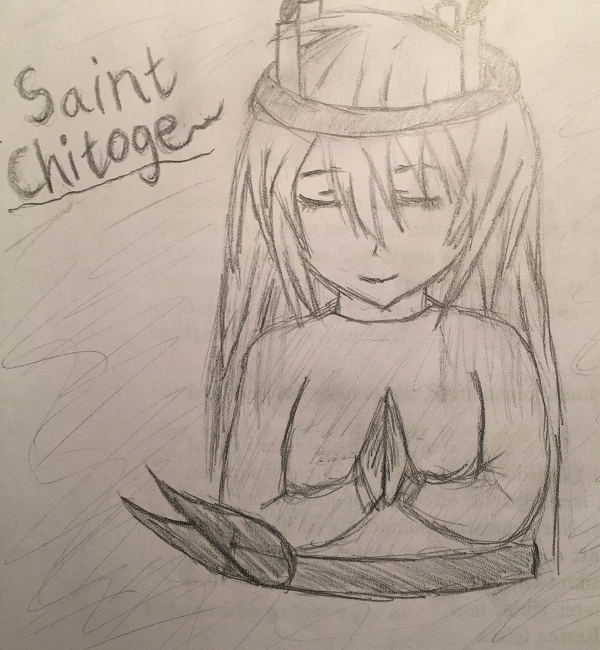 I first ended up drawing a rough sketch with Chitoge wearing the traditional outfit. Afterwards I tried adding some lighter coloring using Paint, which turned out better than expected. 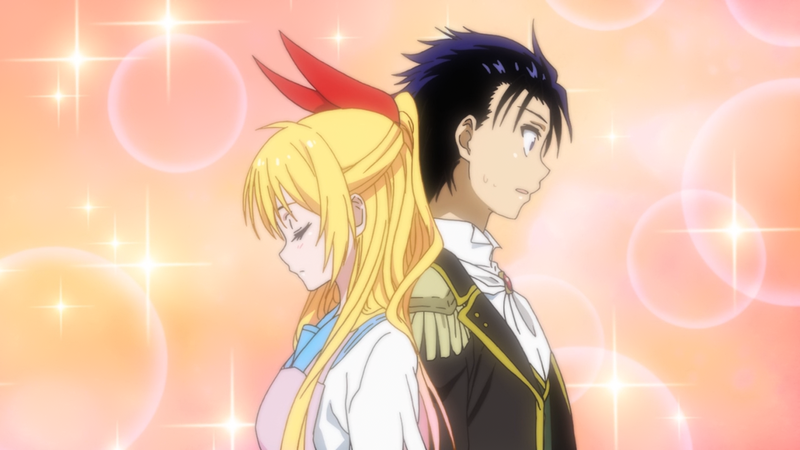 Chitoge’s ribbon is worn around the waist rather than on the head due to the wreath of candles, but once again luck strikes as the traditional representation of Saint Lucia should wear a red sash. The sash itself ended up far too wide, which makes the proportions look off, but it’s something I’ve now learned. Drawing has never been one of my strengths, yet I feel the result came out better than expected. I am happy with it. Based on the song “Fairytale of New York” by “The Pogues feat. Kirsty MacColl”, this rewritten text tells the story of how fans feel about Nisekoi and its author Naoshi Komi. More specifically, it’s about the infamous chapter 162. I highly recommend listening to the original song as you read the following lyrics, as it’s written to accommodate there being two voices singing and sharing their views much like its foundation. I’ve colored the text to make it easier to understand. The editors of the Shueisha Inc. The original purpose of this category was to write a story with crazy hijinks similar to the movie Jingle All the Way. Instead, I decided to tone it down and make it a story about simply going Christmas shopping at the last minute without too much of a rush. However, it must be noted that this is actually an unfinished story. At the time of the competition I was busy studying for exams, meaning there were more important things to do than trying to figure out how to expand upon the narrative. This said, I still think it works quite well even if it is nothing more than an overly detailed script. The ideas came to me naturally as I tried to think about how a Christmas date between Raku and Chitoge could potentially go. In fact, they came almost too naturally. Trying to come up with cliché, silly and heartfelt scenarios was a lot more fun than I ever could’ve imagined and I think doing so has allowed me to understand how it must feel for Naoshi Komi to draw new chapters. This alone makes me wish I was better at drawing. Perhaps I’ll one day try to complete this story. The story is about Raku and Chitoge going on a date on Christmas (Day? Eve?). It takes place on the same day, or at least the day before, when presents are usually given. Note that Christmas is more of a romantic holiday in Japan and presents are mainly given to children. It does also occur otherwise, though, particularly between lovers or really good friends (I believe). It starts with Chitoge texting Raku that she wants to go on a date. It turns out she wants to go on a last-minute Christmas shopping tour for a present to give to Tsugumi. She may or may not also have wanted to go on an actual date and, in addition, perhaps buy something for Raku too. After a small intro with the text message is being sent, the scene cuts to a huge shopping mall in which most of the story will take place. Now an introduction of the characters takes place to ease in unacquainted with the general behavior, backgrounds and looks of the pair. The introduction is brief, but puts emphasis on the fact they may look normal on the outside they actually aren’t: they’re both from gang families, which forced them to pretend being lovers, and Chitoge herself is half-American (both which play important roles in the story). Directly after said introduction the first spoken dialogue is Raku complaining about going on a date on Christmas as it’s a romantic holiday, not to mention they do it all the time. He also points out the fact that it’s odd how Chitoge hasn’t been able to buy a present for Tsugumi (which, naturally, mostly is an excuse for the date and to buy a present for Raku). Chitoge retorts with it being a surefire way to fool the gang families, plus it being more fun and easier to shop if two. Note: perhaps the introduction should come after this instead, as the complaining becomes a hook which is then followed up by a clarification. Moreover, it’d go from “prologue>introduction>scene1>scene2…” to “prologue>scene1>introduction>scene2…” which might be better as scene1 is rather short. From here on they visit various shops in the aforementioned shopping mall. The specific shops aren’t decided, but perhaps a clothing shop would be fitting considering how Chitoge always wants Tsugumi to dress more femininely (such a shop would be a good way to spark chemistry or a potential misunderstanding between Raku and Chitoge). It’d be a good idea if Raku is the one first discovering the bought item, as he’d otherwise be a useless lump in terms of purchasing a gift. Originally Raku was meant to think of his crush Kosaki throughout the story, but as she, much like Tsugumi (other than being a friend), is never introduced – and doing so would bloat the story itself – it might be better to skip it. However, it’d be a good way to lead to a conflict due to Raku daydreaming thus doing something inappropriate and making Chitoge stereotypically punch him. She’d then use the gift to Raku as a way to apologize to him. It’d also lead to a more bittersweet ending and less of a cultural clash like the one detailed below. Eventually the scene cuts and the two, having finally bought a present, are at the exit of the shopping mall. The sun is starting to set and as they are about to leave, Chitoge acts shocked and pretends to have forgotten to buy (for her father?) or do something. Raku offers to come with her, but she declines and says he should go home as it’ll be quick (she actually just doesn’t want him to come along). To make this work, it must’ve been noted somewhere along the date that Raku had stopped outside a particular shop – or at least eyed it every time they passed it – and said “it’s nothing/it’s not necessary” when Chitoge asked him what happened/if he wanted to go in/if he wanted to buy it. The scene cuts yet again and now it’s either later the same day or the day after. Regardless, it’s at Raku’s home. The reason could be spending the evening together as part of the date or such. They greet each other, Chitoge thanks for Raku’s help and so forth. Well inside, Chitoge blushingly hands over her present in a similar tsundere fashion (perhaps noting Raku’s interest in the shop earlier). Raku is surprised and embarrassed, while trying to say he cannot accept it as he hasn’t bought anything. 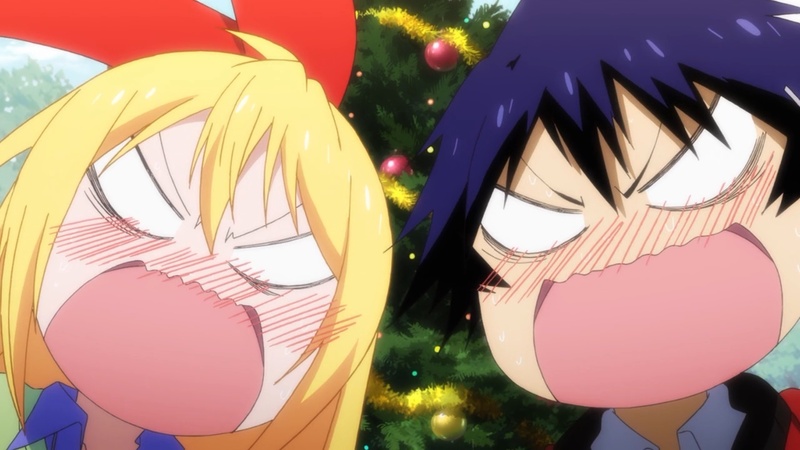 He had no idea Christmas presents were so important to Chitoge! Annoyed, she remarks it’s been a staple ever since she was a small child being half-American and all. Raku apologizes for being dense and, to turn down the intensity of the situation a notch, heaves a sigh – and naturally scratches his head – and gently accepts the present while thanking her with a smile. Inside is a set of cooking utensils for ramen related to the shop he looked at in the shopping mall (it was a heavily discounted promotional item on display). The story does not end there. After Raku stops being really, really excited about his present (due to being a huge fan of cooking) he asks Chitoge to stay put for a while. She’s confusingly agrees as she has no reason not to. Raku leaves and a small skip in time occur. Raku enters the room with ramen he made himself using the Christmas present he received from Chitoge. As Chitoge, much like Raku, absolutely loves ramen – in fact, it’s her favorite food – she digs in with a really happy look on her face. Even if Raku had not bought her a Christmas present, he – much like she did to him – gave her something she loves and that only the two would know. The story ends. This entry was posted in Anime, Editorials, Nisekoi, Series and tagged Christmas, Christmas date, Creative contest, I wish I could draw, Naoshi Komi, Nisekoi fanart, Nisekoi fanfiction, Raku x Chitoge, Rakubowl, Saint Lucia, Valentine's Day. PleasepleasepleasepleasePleeeeaaaaaaassssseeeeee sing the song for us! I won’t! Never! Never ever ever! I spent the last four minutes of self-inflicted pain as I tried to sing and I do not wish to share this harm upon the world. … for some reason I found her ribbon the most fun the draw. It will end soon in manga, its too sad and at the same time very fun and fulfilling. Atlast.